Purchased from Galleria Veneziani, Rome. 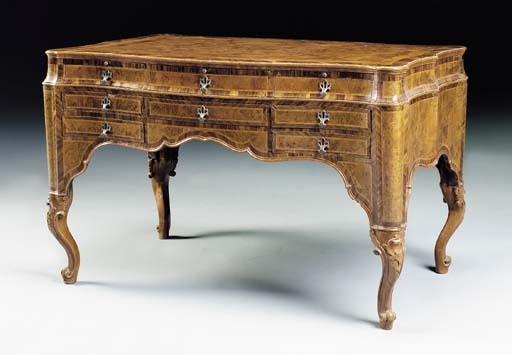 This massive desk with mosaic marquetry in burled woods presents unusual constructional cuts to the tops of the legs where they join the case; it is highly possible that this is a regional convention. A Venetian desk of overall similar form in walnut with olivewood crossbanding which appears to share this atypical leg joint is illustrated in S. Levy, Il Mobile Veneziano del Settecento, Milan, 1964, pl. 205.